I took a few pictures of a group teeing off at the 10th hole. It included Brice Garnett, Billy Hurley III, and Tyrell Hatton. They had a decent size crowd watching them, and to be honest, I was more interested in this excited crowd! I walked with this group to get photos of the players and information from the crowd. George, from Kansas, mistook me for someone else and began talking to me about previous stats of particular players. It became obvious that I had no clue about golf, George introduced himself. He’s been visiting the Heritage on Hilton Head Island for the last 32 years. George specifically requested that I not take any photos of him for the blog, but he gave me some great golf advice: “Golf is all about physics, knowledge of the course, passion for the game, and the right shoes. Unfortunately, your shoes tell me you are not a golfer.” He was right about my sandals (my feet still hurt). George is a lifelong golf fanatic and refuses to miss the Heritage! I also met Mr. Smith from Ohio. After years of taking family vacations to the island, he recently moved to Hilton Head Island to surround himself with golf. He’s a young local golf pro with hopes of playing in the Heritage one day. I understand the basic rules of golf, but Mr. Smith taught me about the hand signals and golf lingo. For example, when referees raise their arm, you stop everything you are doing. As this was my first golf tournament, I didn’t know this extremely important rule. 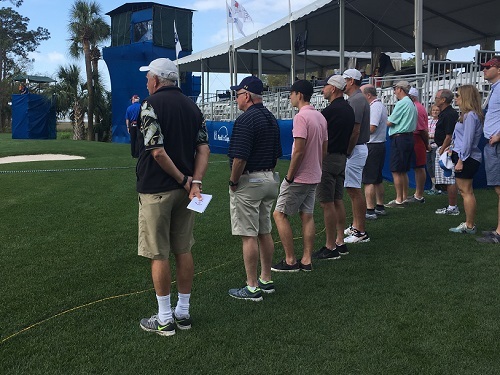 After following this group for 18 holes, I walked back to the 18th hole to explore the booths. There were rows of vendors from shoe shops to liquor tastings. While walking to grab a seat (in the shade because it was a super-hot and sunny day) I passed the Heritage mascot Sir Willie. Of course, I had to take a photo with him! The tournament was fantastic! 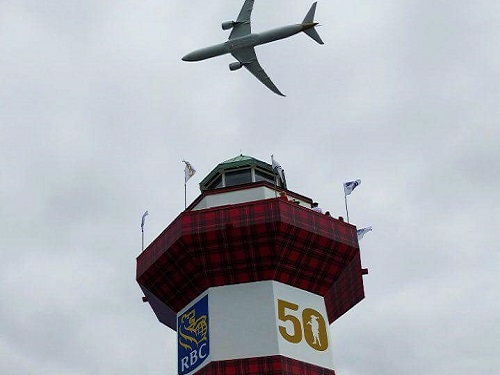 The RBC Heritage presented by Boeing 50th Anniversary at Harbour Town Golf Links was designed by Pete Dye and Jack Nicklaus, in the fall of 1969. 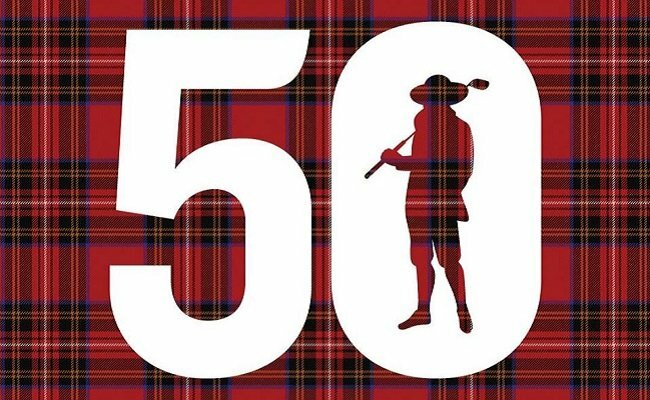 An incredible number of past champions, including the late Arnold Palmer, Jack Nicklaus, Nick Faldo, Hale Irwin, Bernhard Langer, Johnny Miller, Greg Norman, Nick Price, Tom Watson and the late Payne Stewart, have become treasures in the World Golf Hall of Fame. 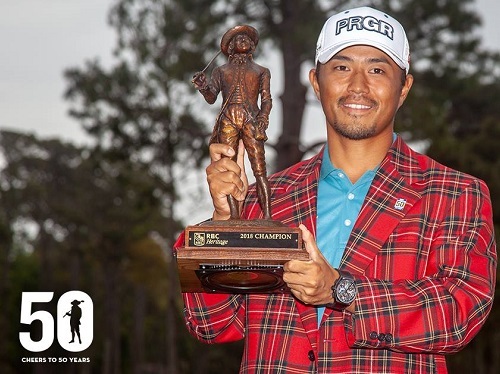 Congratulations to the 2018 winner, Satoshi Kodaira! 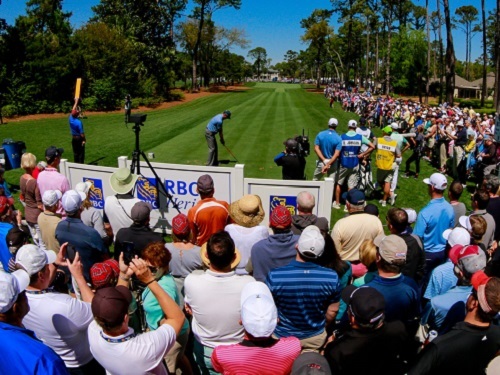 We look forward to the 51st RBC Heritage from April 15 – 19, 2019! Follow Spinnaker Resorts on Instagram, Facebook, and Pinterest for more information on events. 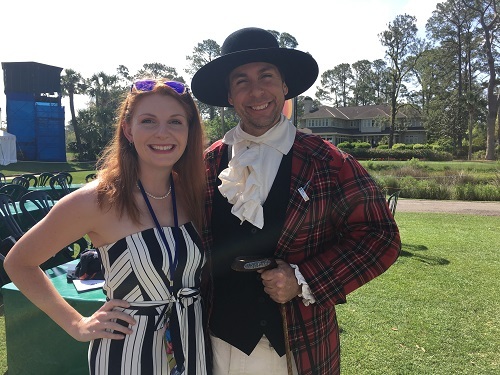 Read our previous Heritage Blog: A Newbie at the RBC Heritage!